TIP: You can save products to your favorites list if you log in Daye Bensa (Oromia region) is a largish export company founded in 2006 by brothers Asefa & Mulugeta Dukamo who were working as coffee suppliers from the Sidama region. 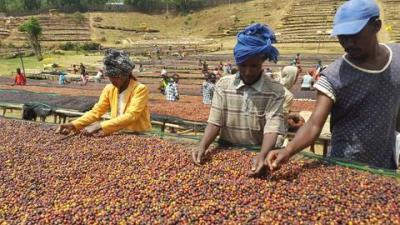 They have fifteen coffee washing stations and four dry coffee processing mills in the Bensa, Aroressa and Chire districts of the Sidama zone. This Grade 2 washed coffee comes their farms in Shantawene Village near Bensa, Limu and is a “composite” of local heirloom varietals grown at between 1600 and 2000 meters. The light-medium profile notes of Black Tea, Dried Apricot, Floral, Peach and Honey, correspond along many tangents to fine Yirgacheffe coffees we have carried (and will be bringing in shortly! 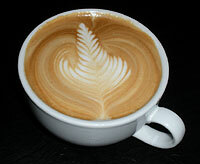 ), making for luscious pourover and drip, complementary to savory dishes and desserts. A winner! 1 lb. bag $14.00 lb. "Sumatra Triple Pick Lintong There's a swamp mud jungle funk going on here. Aromatically, Doctor Livingston's cherries have fallen out of his knapsack and lie among the moldering leaves, next to a bog. An Irish peat bog. Lightly singed. In Sumatra. Go figure. That smoky peat-water thing carries to the body - ROBUST I believe is the word. Sweet, voluptuous presentation quickly yields to the gripping, chunky tannins wrapped in licorice that dominate the midpalate. Longgggg finish spiked with orange rind, cardamon,wood shavings, and leaf mould. This is potent stuff. Diane can't drink it. (She loved the Etheopian Mothership.) My inner orangutan, however, loves it. "